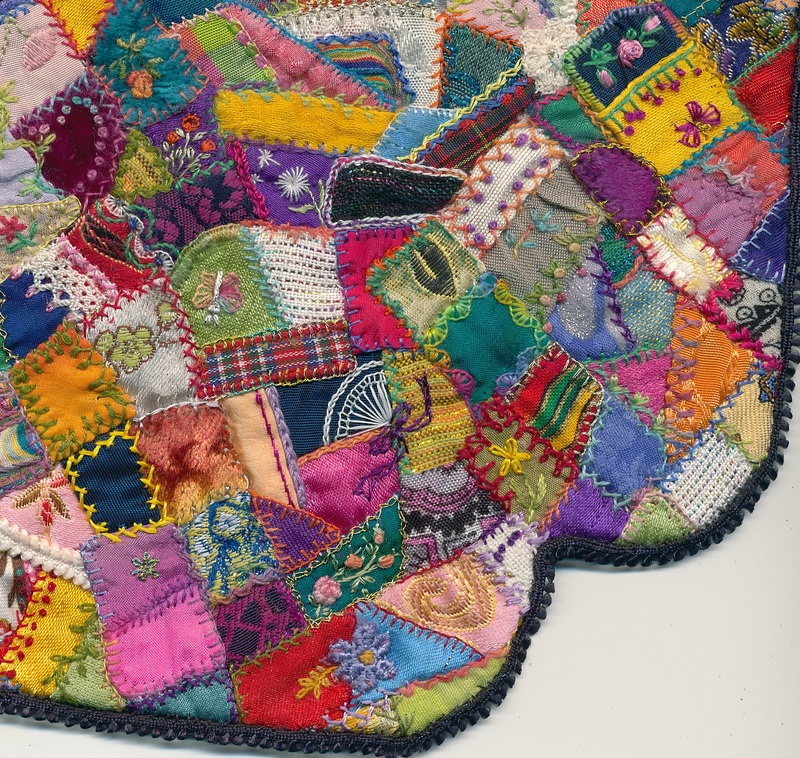 Today I finally finished the 1:12 scale crazy quilt that I have been working on for the last two or three weeks. The whole quilt measure 8 1/4 inches x 7 inches or 21cm x 17.5cm and there must be at least two hundred tiny patches, I haven't counted them all. Each one is embroidered around all sides just like in a real crazy quilt and the tiny black edging finishes it all off. The edging was one that I bought in England when we were there two years ago but it was sky blue, so taking up my husband's suggestion, I dyed it black and then slip-stitched it around the edges of the lined quilt once it was dry. I am posting this to both my crazy quilting blog and my doll's house miniature blog because it fits them both. The straight edge is the top while the curved bottom edge is designed to go down the end and sides of a four-poster bed. I used the stitch and flip method of piecing the tiny patches by hand, using a 3 mm or 1/8 inch seam and tiny running stitches. This is a close-up of the bottom right hand corner showing some of the decorative motifs such as a butterfly, Rose spray and fan. this is a wonderful accomplishment, how many new pairs of glasses did you need to use- the squares are so tiny I do not envy you. It will look so beautiful in your dolls house, amazing! Well done Viv, this is great. So tiny and beautiful! Thanks for sharing it. Love it! I am amazed how how many pieces of fabric you used to make this beauty! Very very pretty! 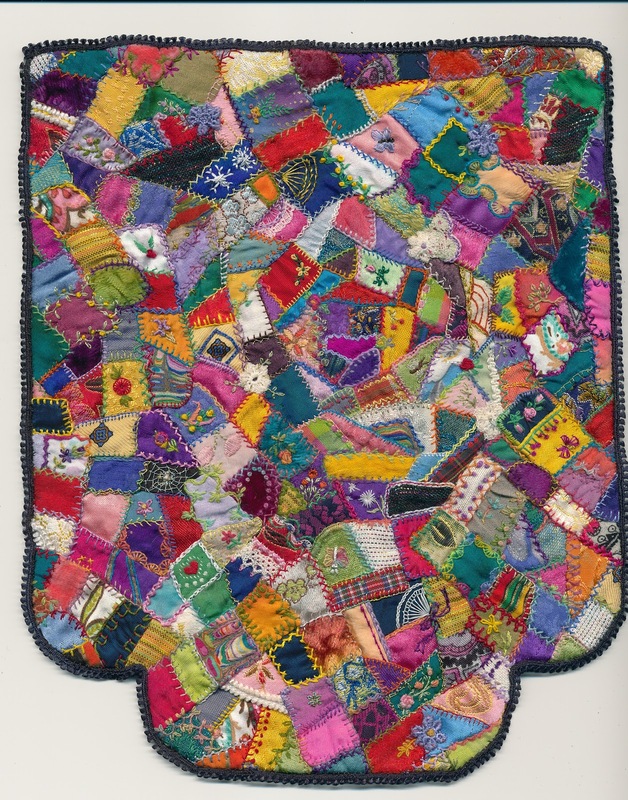 This crazy quilt is a leader of work, tiny by the size but big by the talent! He is magnificent, bravo! Only you could stitch so very tiny and turn out such MAGNIFICENT results!!! Bravo, Viv! !